I had a good week of stashbusting. 1. I didn’t buy any fabric, even though there was another sale at Thousands of Bolts. 2. I made the binding for my Simply Leaves wallhanging, and got that fabric out of my stash. 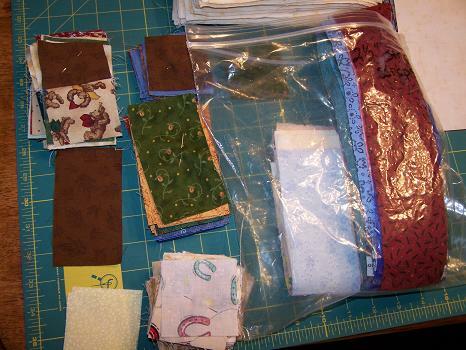 I also attached said binding, and a label, thus completing that WIP. 3. I made the binding for a lap quilt I made for my son, earlier this year, as well as the binding for my New York Beauty wallhanging, which has been bindingless for quite some time. 4. I added the borders to the courthouse steps top. The inner border was strips that I already had cut for it, a long time ago. I used 3.5 yards of fabric, from my stash, for the outer border. I used 8.5 yards of fabric, from my stash for the backing. That quilt is currently loaded on the longarm, with quilting in progress. 5. I have continued to whittle away at the scrap pile, turning it into strips, and leaders/enders, some of which I’ve already started sewing. I usually remember the “leader”, but have a tendency to forget the “ender”. I’m working on that. Thus concludes another successful week of stashbusting. You are making progress Randi. Don’t you love using what you have even though you have to fight the urge to buy more beautiful fabric?